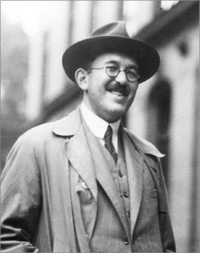 Otto Stern was Emeritus Professor of Physics at Carnegie Institute of Technology (1945-1969). Other institutional affiliations included University of Hamburg and University of Frankfurt. His contributions to physics included the Stern-Gerlach experiment (the discovery of space quantization), the measurement of atomic magnetic moments, the development of the molecular-beam technique, the discovery of the anomalous magnetic moment of the proton, and the demonstration of the wave nature of atoms and molecules. February 17, 1888Birth, Żory (Poland). 1912Obtained PhD in Physical Chemistry, University of Breslau, Wroclaw (Poland). 1913 – 1914Privatdozent in Physical Chemistry, Eidgenössische Technische Hochschule, Zurich. 1914 – 1921Privatdozent in Theoretical Physics, University of Frankfurt, Frankfurt am Main (Germany). 1921 – 1922Associate Professor of Theoretical Physics, University of Rostock. 1923 – 1933Professor of Physical Chemistry and Laboratory Director, University of Hamburg, Hamburg (Germany). 1933 – 1969Research Professor of Physics (1933-1945) and Emeritus Professor of Physics (1945-1969), Carnegie Institute of Technology, Pittsburgh (Pa.). 1943Awarded Nobel Prize in Physics "for his contribution to the development of the molecular ray method and his discovery of the magnetic moment of the proton". 1945Member, National Academy of Sciences. August 17, 1969Death, Berkeley (Calif.). Research advisor at University of Frankfurt. Post-doc advisor at University of Zurich. Advised as post-doc by Stern at University of Hamburg. Professor of Physical Chemistry and Laboratory Director. Associate Professor of Theoretical Physics. Obtained PhD in Physical Chemistry (1912). Albert Einstein letters to Otto Stern, 1914-1917. Norman Ramsey materials on the history of magnetic resonance, 1983-1995. Otto Stern : Physiker, Querdenker, Nobelpreisträger / Horst Schmidt-Böcking; Karin Reich. Otto Stern Nobel Prize biography. Otto Stern, Co-discoverer of Space Quantization, Dies at 81 Physics Today obituary. Recent research in molecular beams; a collection of papers dedicated to Otto Stern on the occasion of his seventieth birthday.